Welcome back, Warriors! We just saw how to check if a particular data is present in a table’s specific cell with and without using XPath. Time to loop through each element and visualize the power of Selenium WebDriver. Let us go back to our Demo Site and focus on “Books & Authors” table to understand this concept. Calculate the total number of rows and columns using XPath. Let us find the total number of rows using absolute XPath. Note that the XPath ends with the tag name, ‘tr’. The size() method gives the number of elements returned by findElements() using XPath. Let us switch gears a bit and find the total number of columns using relative XPath. This method of finding the total number of rows and columns is useful in case of tables whose rows and columns change dynamically. If the table rows and column numbers are fixed, then looping through each table element becomes pretty easy. Two for() loops, one for rows and the other for accessing column values can be used. Someday, if you are lucky, you might stumble across a table that loads dynamically with each page refresh and hence the number of rows usually varies. And therefore, the row count is to be calculated every single time test is executed. First, let us get all elements with tag name ‘tr’ and put them in a list named ‘rowVals’. To get the header elements from the first row, find all elements with tag name ‘th’ and put them in a list named ‘colHeader’. To print each header text to console, loop through the header values from colHeader list and use getText() method. 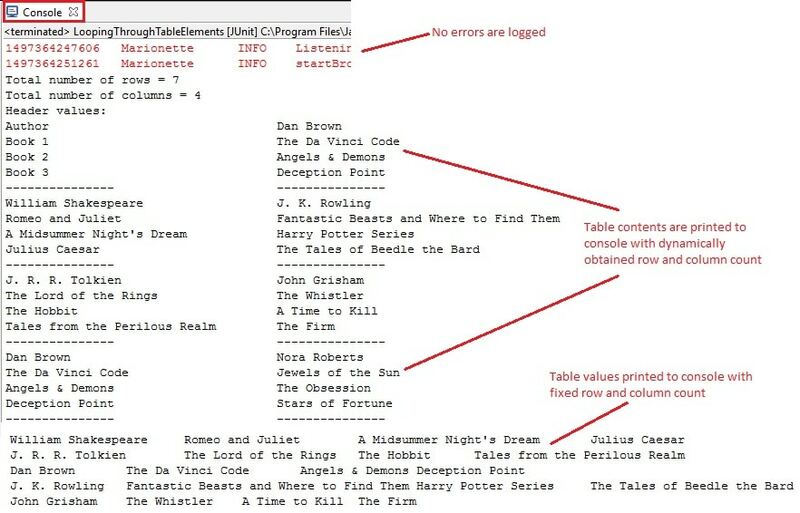 To print table contents to console, loop through the each row. For every row, traverse through each column and print the values using the same getText() method. Is your ability to focus sliding downhill? If yes, let us look at a BrainBell! BrainBell – Visualize! Most of us know that creating a mental picture for the concept we wish to remember makes it clearer and easier to remember than words. What we don’t know or do is, visualizing it carefully for a few seconds. This will help to recall it with ease. With that being said, let us see the overall picture of what we discussed so far! Each line of code is well explained as part of concept covered thus far. Upon noticing eclipse IDE’s JUnit view, green bar shows that the test case is executed successfully. Console window shows the absence of any errors. It also shows the printed table contents for both fixed and dynamically calculated row and column count as expected. Hope I always give you something to ponder! See you soon in another post. Using Tagname with tr and td takes much too long with big tables.